I was home watching my little buddy yesterday, so that mean's a nice midday snack of something to review for the blog. I was doing my best to relax and not worry about work, or chores, or anything else. I did my best to clear my mind and figure out what the best treat would be, and then it hit me. Chocolate! I need Chocolate! My chocolate addiction is in full swing this week, so let's see what we can do about it. 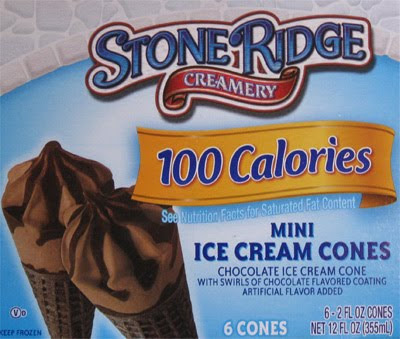 Ahhhh, here to help is Stone Ridge Creamery with their 100 Calorie mini ice cream cones. And it's not just chocolate ice cream, it's Chocolate ice cream with chocolate swirls in a chocolate cone. Mmmm, I do adore Chocolate Ice Cream Cones. Ooooooo, shiny! Ok, don't ask me why it's shiny but I'm sure it will get everyone's attention. Actually, it kind of reminds me of a candy bar wrapper. Ugggg. That wrapper may be shinny, but it's not well made. I've opened 3* of these bad boys and every time the wrapper sticks to the cone and yanks off some of the chocolate swirl --- to show this, the image above is actually the same cone. It doesn't help that the swirl is extremely thin, so it offers up no resistance when you are pulling the wrapper off. Ok, enough observing, let's dig in! Oh, weird, the ice cream has the texture of frozen soft server. The taste is fine, but man o man is the texture off. Hmmm, guess that's how they got to 100 calories! The whole treat only weighs 38 grams! Ok, looks like licking is the only way to get around this texture problem for now. That, or well, I was kind of shoving the ice cream done into the cone, which has a somewhat nullifying effect on the airiness of the ice cream. Wait, did I just sneak nullify into my review? Now, for me (and I've said this before), it's all about the cone. The cone has to deliver the crunch. No crunch, no interest. Zero. Zip. If you can't bring the crunch to the game, don't bother showing up, you've already lost. Well, it's not perfect, but we have some crunch. It's not perfectly crunchiness, we do have some intermittant chewiness, but to make up for it, we have chocolate. 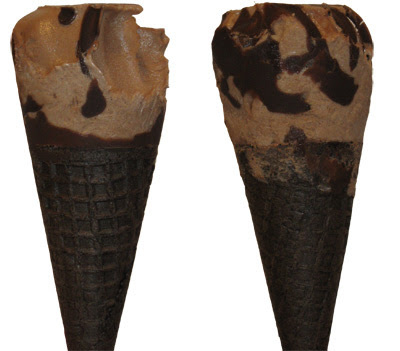 Mmmmm, I do love chocolate cones and I'm so happy to see a company bring chocolate happiness to a mini cone. the low cal chocolate ice cream is going well with the chocolate cone. Not awesome, not great, but I'm happy enough at the moment. The only problem is, I wasn't full, so I happily had another. *Guess what? I've already done my second scoop, it was at 5:45AM this morning. Usually I just have OJ before I start to get ready for work, but I was dying for a little something special --- time for a mini cone! You know what seals the deal for me? 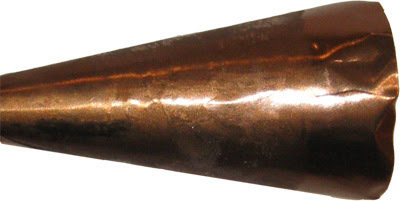 The little bit of extra chocolate swirl at the bottom of the cone. This may be some kind of funky low cal ice cream, and the treat does start slow, but the cone finishes strong and leaves the perfect chocolate aftertaste in your mouth. It's the same reason I love drumsticks. Recap: Not perfect, but definitely worth a try!